The Invisible alternative to traditional braces. 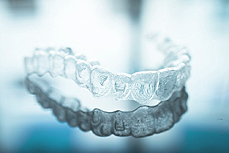 Clear plastic aligners will gradually move your teeth into the desired position. Invisalign straightens teeth very much like braces, but by using a series of nearly invisible, removable aligners that are made specifically for your teeth. Each aligner is replaced every 1-2 weeks, which will in turn move your teeth – little by little, week by week, gradually moving towards the projected final position. Comfortable and removable – Invisalign transforms your smile without disrupting your life. Something that over 4 million people worldwide have already discovered.